I’m going to teach you how to optimize your email marketing campaigns (something I promised in the last post) using a funnel. 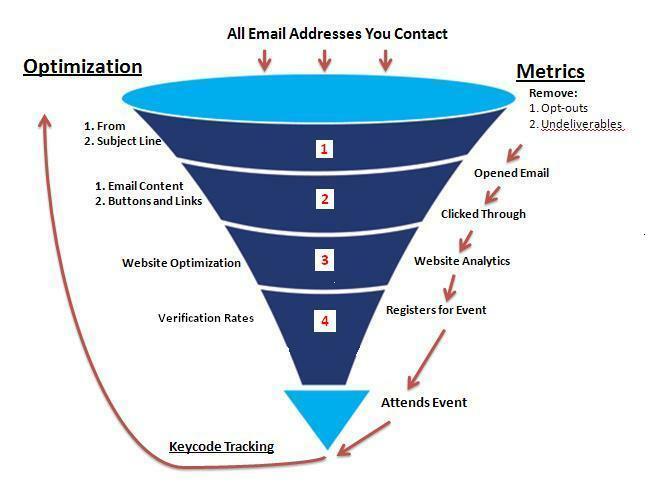 My colleague and good friend David Mausolf (who is an amazing marketing analyst) and I originally wrote this how-to for StartupDigest as a guide for using email marketing to promote events. But it can be used for any variety of email campaigns: The lessons learned are the same. I’ve updated some of the text because of this. This post is intended to show you how to deal specifically with metrics and optimization – I’m not touching on things like content here. It’s as simple as this: Email contacts go in; buyers of your product or registered attendees of your event (a percentage of your contacts) come out. What’s in between can be measured and optimized. I’ll show you at each step 1) what you need to measure and 2) what you can improve. You must be sending HTML, not text, emails. If you’re a marketer with limited resources, and you’re on the fence about whether to devote money and time to analytics, consider this: Without analytics and optimization, you’ll never know if what you’re doing works. You can potentially waste unknown amounts of money and time on campaigns that bring in nada. Testing your assumptions and measuring their results is the only way to show your effectiveness. Your open rate – percentage of recipients who opened the email – is the focus here. An open rate is recorded by a 1×1 tracking pixel placed in the HTML. Be wary about this number, as it can be quite misleading. Because Gmail does not automatically download images, for instance, the 1x1tracking pixel is not automatically downloaded and thus that open goes uncounted. Databases that contain a majority of Gmail addresses, therefore, will have a conservative open rate. Compare this to databases that have a majority of addresses on email services that default to showing images. These will cause a more accurate open rate. Please note that there is no magical open rate number just like there is no magical click-through rate. Success is relative to your goals, how well you’ve targeted your lists, and reasonable expectations. Although subject lines get a lot of attention in optimization discussions, the from line can be much more important. This is where your brand awareness campaigns pay off: People open emails from people or brands they know and trust regardless of what the subject line is. Consider your reactions to different emails you receive. Click-through rates as well as opt-out rates are of primary concern. This can all be done with good ol’ scientific A/B testing. A great place to start learning and getting great ideas for testing is at Anne Holland’s Which Test Won blog. Concerning Opt-Out Clicks: If a large number of recipients opt out, rethink who you’re sending to, what offers you’re making, how many times you’ve emailed them over what period of time, and what your tone is. I always experiment with these factors to decrease the chance of a recipient opting out. Share feature: This is a great second action you may want your recipients to engage in at this step in the process. Encourage your recipients to share the email with others on their social networks. Silverpop, for example, offers a feature called Share-to-Social, which I have used and found adds great value. Further discussion about this, however, is outside the purview of this post. The landing page from the email goes to a web page on a site you own, and you have a web analytics system (like Google Analytics) set up to measure traffic from the URL in your email. The landing page from the email goes to a third party page you can get metrics from (as they’re a partner/paid third party vendor). For event planners, you could use sites such as Eventbrite.com. In both cases you can most likely embed keycodes in the URLs used in your email to track landing page numbers and registration conversions. If possible, you can use different keycodes for different segments of your lists to track how they perform. Think coupon codes – every marketer should be familiar with tracking coupon numbers to know what campaigns work. So, at this point you’re tracking 1) what’s being clicked on and 2) are they registering. Event marketers: Your job isn’t over yet, especially if registration was free. As all event marketers know, verification rates (the number of people who actually show up on-site) are considerably lower for free events. It’s rough to have 200 people register and only 20 show up, especially if you’ve bought food enough for those 200 people. Whether your event is free or paid, you need to keep in mind the verification rate. This affects more than just your food budget and rental space – consider how your sponsors will feel if you promised a large crowd and end up with the Usual Suspects in the tech networking scene. How do you increase verification rates for your events? The answer, once again, is email. Stay in touch with those who have registered by emailing them a few times before the event with updates on such things as post-event parties, new speakers, and content additions. SXSW does a great job with their newsletters sent to registrants, and is a great case study if you’re looking for one. Newsletters can be used for any product or service you offer. The same logic written above applies to you. Send emails that provide more than sales pitches to keep your customers interested. Interesting content such as interviews, how-to’s, reviews, and more should all be considered. I’ll delve deeper into this another time. Everything you learn from the email marketing cycle of a particular marketing campaign should be used for the next cycle. Keep track of your data and tests! Now that you have a framework for your email testing, you’ll need to learn more about keycode tracking, A/B testing, copywriting for email, website analytics, list segmentation, and email database management including lead generation to continual build your lists. While this may seem a daunting task, remember that email marketing is the best way to not only market a one-time event, but to maintain relationships with customers and keep them coming back time after time.